The solar-powered Mistbox adapts technology designed for commercial A/C units for use with smaller residential systems. Late last year, a Texas-based startup showed up on Kickstarter with a smart device that promised to not only cut residential air conditioning bills by nearly a third—saving homeowners enough money to pay for the unit in a single season—but would also make A/C units last longer. That promise, combined with the solar-powered system’s eligibility for a 30-percent federal tax credit, convinced more than 600 backers to take the plunge. Today the company announced that it was shipping product to backers, who scored significant discounts, and that the device is available for sale to all. The device itself appears to be exactly what was promised, but its name has changed from The Mister to Mistbox. Why this matters : The underlying idea has been around for decades (albeit mostly in commercial air conditioning applications), and the Mistbox’s developers are the first ones to admit as much. They contend they are the first to adapt it for widespread residential use. 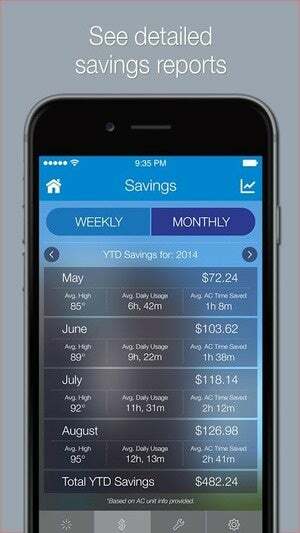 Mistbox developed a smartphone app that can analyze your savings and perform other tasks. Evaporative pre-cooling solutions, such as this one, sap the heat out of the air surrounding an AC condenser unit with an infusion of tiny water droplets. 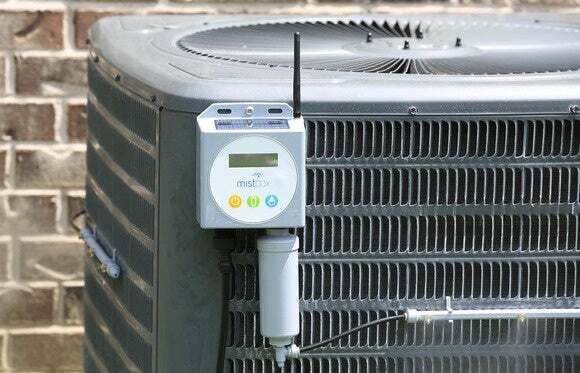 This can be of great help on unbearably hot days, as it makes it that much easier for the condenser to cool the refrigerant, which is what ultimately cools the air inside your home. Reducing the workload on your A/C unit cuts your energy bill and extends its useful life. The device is powered by a 96mm x 54mm solar panel that works with direct or indirect light, backed by a 7.2V NiMh rechargeable battery for nighttime operation. Mistbox knows exactly when to mist thanks to its built-in temperature, sound, and magnetic field sensors. Data related to power consumption and savings is delivered over Wi-Fi and is accessible via a mobile app. Based on the product manual, the initial setup should take no more than a few minutes for anyone who can follow some basic instructions and handle a screwdriver. According to the company, the device ships with everything you need to get started. The package includes the main control unit, water filter, 30 feet of water-supply tubing with an adapter, a self-tapping screw, zip ties, spray-bar clips, and a Wi-Fi antenna. The website states the product is covered under a two-year manufacturer’s warranty, which is double of what was promised during the Kickstarter campaign. As for life expectancy, the company sees Mistbox comfortably lasting around 10 years as long as the water filter is replaced once every season—a recurring expense of $30.